On my second adventure to talk with business owners in downtown Brantford, I decided to go to the other side of the tracks, from Clarence to Murray. Although ‘downtown’ only extends as far as Alfred street, the next few blocks certainly feel welcome in the neighbourhood and the downtown community. Many businesses in this area chose their location because they seen a community that they wanted to be a part of and wanted to help this area flourish within the city of Brantford. This area sits close to all the amenities of downtown but it is also a growing neighbourhood within itself and has much to offer. You could easily spend an afternoon strolling the area with a coffee and treat from Three Blind Mice perusing the shops, with 2 hour parking along the street! So what does a florist, coffee & specialty goods, thrift store, heath shop and bridal shop all have in common? They are all working on strengthening the image of these few blocks between Clarence and Murray on Colborne. Emelines Cashe has only been open a month but the owner, Lesley, had wanted to open a store in the downtown area for some time. Lesley enjoys this area a lot and pointed out the food, art and churches as some of her favorite aspects. Lesley was sitting at Maria’s Pizza, when she looked across the street and decided she wanted to see something beautiful there too. Like the other business owners I spoke with, she wanted to add to the neighbourhood something good. 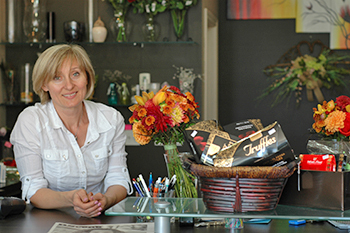 Olga, owner of Brantford Blooms, also noticed something missing from the area and started a floral business that really brightens up the street. 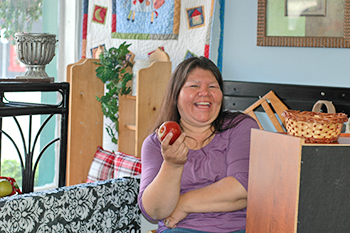 Olga believes the “town will grow someday into a better place” and that this area could still use some improvements and support before it will fully bloom. When the Source closed down Taryn opened Tip Top Health Shoppe for “a whole population who no longer had access to healthy food or vitamins. Taryn also noticed that, “downtown is starting to revitalize and I wanted to be part of that turning downtown, wanted to be part of the process. 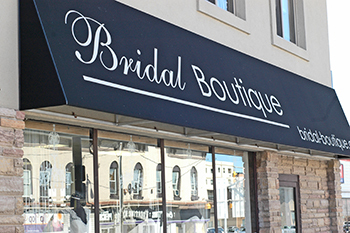 Although these three businesses decided to open their stores here, Lily, from Bridal Boutiques, explains that several years into business they decided to move to their current location on Colborne. With the traffic coming in for the Casino and events, it brings many people by their shop and she is happy with the new location. She also enjoys the student population being so close by and believes that being a destination shop makes location a little less relevant because people will come to you for their occasion. With uncertainty a big part of any small business, most businesses simply plan on making it to next year and, hopefully, with an increase in profit. Some businesses are definitely planning to stay in the area and maintain, such as Bridal Boutique, which bought the building to show they weren’t kidding about staying. 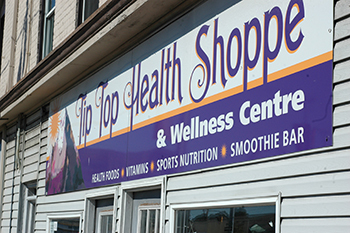 Tip Top Health Shop would like to keep growing, informing the community about healthy alternatives through classes and products. Three Blind Mice is also looking to stay in the area and expand their services. They would like to create a small outdoor café to create more seating and be able to hire from the surrounding area. Emelines Cashe sees their location as the “birthplace of this business” but also feel that it would like to “go on to help people that are unemployed or non-skilled.” Although they have only been open 3 weeks, Lesley is hoping to get involved in using her business as a step for training and skills for those who need it most. With a number of thoughtful community-oriented businesses in the area it will be exciting to see who comes into the area in the future and how they will fit into the current dynamics, values and directions these business owners have envisioned. Although there are a variety of services in this area, there are also a number of empty lots and broken links that could be improved upon. I asked these business owners what they thought the area needed most and they offered several interesting and noteworthy ideas. Everyone agreed that the area could use more attention on aesthetics. Trees along the road, more flowerpots, and garbage cans were just some of the ideas to “beautify” the area. Emelines Cashe’s owner also thought the railroads could be made more attractive if we highlighted them as an important aspect of Brantford and created “signs bigger than life, think Disney.” Although already running a thrift store, Lesley would like to see more thrift stores in the area. She pointed out that “everyone is carrying something different” and “it is good to have options.” A museum or mini-museums could also enhance the good Brantford already has to offer. already feeling the need for more parking, although she also notes that most her current customers are pedestrians who live close by. They have certainly noticed the increase in attention already beginning here and they hope to keep the momentum going. A few business owners mentioned that they felt the city of Brantford had confidence in the area as they have already improved the roads and added some street parking along the side roads. Supporting one another has been key for many of these owners and they know that public support and shopping locally could ensure their business lives in the area.